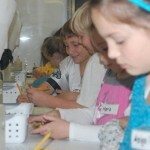 All students will be experiencing a science lab lesson in the PA Farm Bureau’s Mobile Ag Ed Science Lab. The mobile classroom lab, complete with all supplies and a certified teacher, teaches science lessons based on students’ grade levels. The lessons meet the Pennsylvania Department of Education Science & Technology and Environment & Ecology Standards and each teaches a lesson in agriculture. 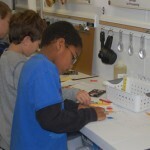 Mrs. Altdoerffer’s third class participated in The Colorful Bean investigation and demonstration. Students were presented with two types of crayons – one petroleum based and one soy based. They experimented to determine which crayon produced the brightest color with the least amount of flakiness and provided the best coverage. 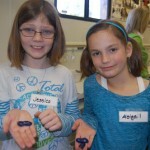 The students learned about soy based crayons and the teacher made soy based crayons for the students to take home. Other lessons being taught include Glue From Milk, Thirsty Stems, Water Analysis and Farm Charm. 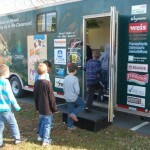 For more information on the Mobile Ag Lab, visit aglab.pfb.com.